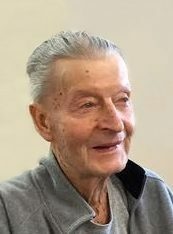 Leonard L. Divis of Brainard, died Thursday, October 18, 2018, at the Eastern Nebraska Veterans Home in Bellevue. Visitation Tuesday, October 23, 2018 Noon-1:30 P.M.
Leonard L. Divis passed from this life on October 18, 2018 at the Eastern Nebraska Veterans Home in Bellevue, NE. Leonard was a quiet but strong man, tough, yet tender hearted. The second child of nine blessed to the union of Albert Divis and Ludmilla (Kudlacek) Divis, Leonard Louis Divis was born on December 13, 1924. He graduated from Brainard High School in 1942 and served with distinction in the U.S. Army in Northern France during World War II. He was captured by the Nazis in September of 1944, spending the rest of the war as a POW in northern Germany. After the war, Leonard returned to Loma and farmed the homeplace with his brother Don for the next 50+ years. He also was a member of the American Legion Post 273 of Brainard for 73 years. Leonard led a uniquely solitary life but nevertheless touched many people. Leonard is preceded in death by his parents, an infant sister, Eleanor, and older brother Tom. Leonard is survived by his sister Alyce and brothers, Don, Albert Jr., Eugene, and Edwin, several nieces, and nephews and friends across Butler County. A memorial service will take place on Tuesday, October 23rd at Kracl Funeral Chapel in David City Nebraska. Burial following in the Loma Cemetery with full military honors where Leonard will be laid to rest near his parents in the beautiful rolling hills of Loma. Memorials can be made in his name to Rejda Post 273 American Legion.